Product prices and availability are accurate as of 2019-03-02 17:11:21 EST and are subject to change. Any price and availability information displayed on http://www.amazon.com/ at the time of purchase will apply to the purchase of this product. We have specialized in researching and developing environmental-friendly and user-friendly LED grow lights for 8 years. You can enjoy 1 year Worry-Free Warranty and 7/24h Fast Response After-sales Customer Service. Blue Spectrum is good for photosynthesis, helping to produce Chlorophyll and Carotenoid which are necessary for healthy leaves. Red Spectrum is best for bloom and fruit. [Lighting Time] Generally 10~12h,day/night on/off as a cycle. [Theoretical Hanging Height] Seedling: 1~8". After 1/2 weeks: 4"through the rest of Veg. Flowering: 1~4"
Indoor use only, no waterproof. 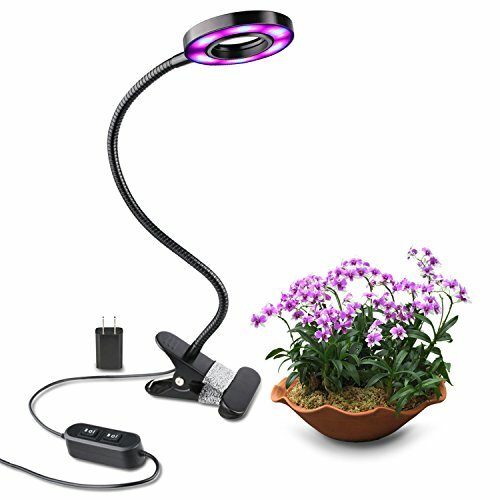 ADJUSTABLE AND FLEXIBLE: 360°Goose neck with Led desk CLIP to desks or tables and offers a full range of flexibility for convenience and enhanced plant growth. The GOOSENECK ARM can be adjust to any position and direction to provide the light for more adaptability and accessibility. 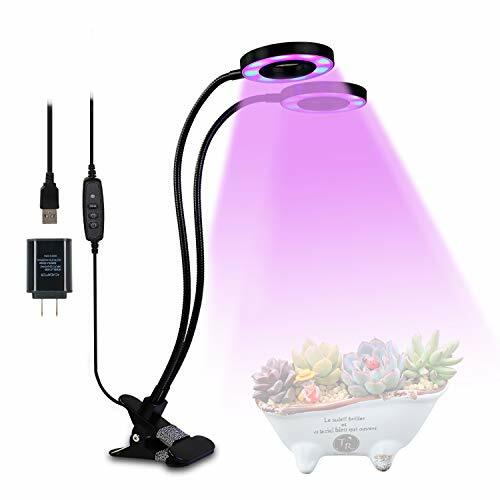 Plug in and Switch ON/OFF - convenient design and quick light replenishing their energies for your plants. 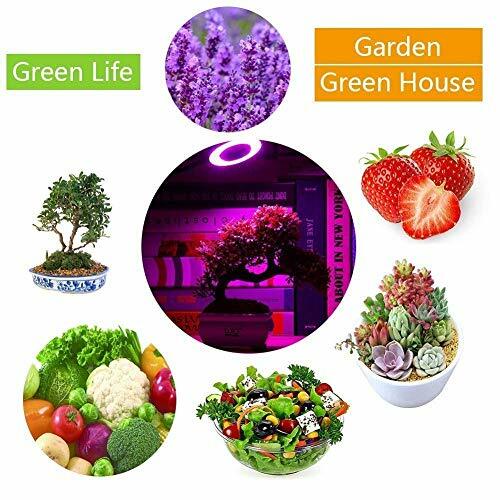 18 LEDS: Usually you will find LED grow lights that have a combination of red and blue lights. 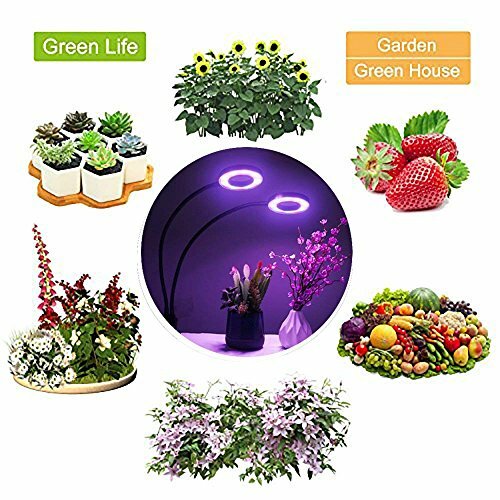 You can use separately and also mix up those lights generating different light spectrum from the 18 PCS LED plant grow beads. 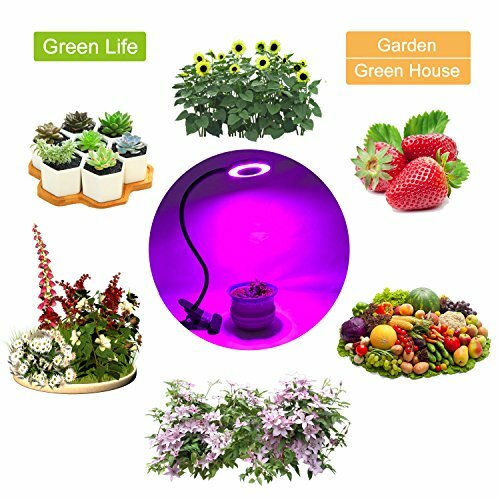 This light have 12 red (wavelength:660nm), 6 blue (wavelength:460nm), best for blooming up, advancing and growing the fruit, leaf. It can rapidly improve the health of the plant. DIMMBLE 6 MODES and SIZING: You can switch the BRIGHTNESS of the light by using our dimmer control and adjust the distance between the light and plant according to plant needs. 21.55 inches height (545mm: from base to head of lamp) - Clamping range up to 3 inches - Cord length: 57 inches. PORTABLE and CONVENIENT - Easy to install at your home or office. Suitable for balconies, greenhouses, darkroom, office and so on. Widely apply to the culture solution, gardening, family balcony seeding - seedling - breeding, Flower Show, potted plants, especially when the plant needs extra light when raining, snowing, dark indoor, etc. USB CONNECTOR PLUG: The adapter have an USB cable facilitating and giving you the option to plug into a wall outlet or an USB interface. Compact design, strong metal clip, 3 ways to fix the clamp (Clip, Screw or Stick). It can be placed anywhere you want to put. Easy to install into your home or office. Can be widely used indoor with a wide variety of plants.